Seamless vacuum-formed liners fit neatly into all standard 5-gallon pails. Contoured lip snaps over top rim of pail to prevent slippage. Plastic Pail Liners are tapered to fit standard plastic pails. Steel Pail Liners are straight-sided to fit standard steel pails. Cradle Liner permits shipping two-part products in one pail. 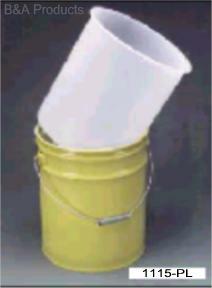 High density polyethylene cradle holds a one-gallon can. Choice of three FDA-approved materials: Low-Density Polyethylene for general purpose use; High-Density Polyethylene, featuring rigid construction for easier insertion into the pail and resistance to inks, paints, adhesives; Polypropylene, with rigid construction and high temperature resistance for hot-filling.